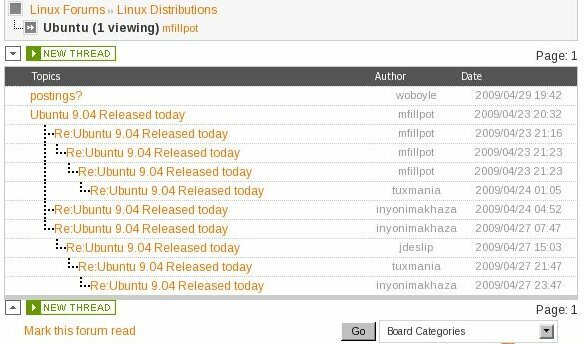 There are supposed to be 9 postings in the "Ubuntu" forum, but I can only see one. Is there a way to expand the listings to see all (even read) ones, or is the '9' postings incorrect here? That will modify the view to appear like the attached image. ... or in the top grey field above your profile information, you can find a switch to change the Forum view to "Threaded" instead of "Flat". By the way: there should have been 9 Replies, but only one Discussion, at the time you wrote the post. Yes, but just clicking on the posting doesn't show the replies, which I find are as important as the original posting. I like to see them all together. Perhaps a switch to "Show Replies" would not be amiss, and a user preferences to allow that to be the default if desired?